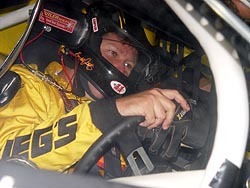 Gary St. Amant was disappointed after the race on Saturday night, and he should have been. It really looked like the veteran had the fastest car on the track for much of the night, but a simple little mechanical problem kept him from his first victory of the season and a possible shot at the points lead. That wasn’t St. Amant’s only problem at the end. 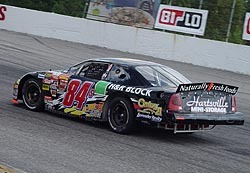 However, despite losing some ground to race winner Gordon in the points, St. Amant was able to move up to second. He is 52 points out of the top spot. The #22 Ricky Benton Racing ride has seen its fair share of drivers this year. Matt Carter started out the year in the ride, but was then replaced by Jay Fogleman. 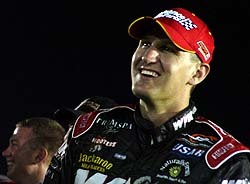 Fogleman lasted a few races in the car before heading back to his own team. So owner Ricky Benton decided to put Brad Rogers, a former Pro Cup Series winner without a full-time ride, in his car for the remainder of the year. The post season has proven that to be a very wise choice for the team. St. Amant caught race leader Benny Gordon and passed him with ease just past halfway. His lead was short lived though, as St. Amant came out of the pits second following a round of pit stops not that long after. However, after the stops, St. Amant’s car didn’t quite look the same. The former ASA National Champion laid back on the restarts and couldn’t quite muster the speed he could earlier in the event. Rogers put in another solid performance behind the wheel of the No. 22 at Myrtle Beach, coming home fifth after starting near the very back in 30th. “It was an exciting race. I think everyone is pretty happy,” said Rogers. “We started 30th and came to fourth at one point. With 10 laps to go Rogers lost radio communication with his crew while running fourth, which contributed to his losing a spot on the track in the waning laps. Rogers and the team have three top-six finishes in their four races together. He has moved up to 12th in the points standings. "Everybody’s pretty excited," Rogers added. "We just have to find a little bit more to get this car in victory lane. I think our chances are good when we go to Motor Mile (Speedway, Radford, Va.) for the next race; I like it there, and feel real good about going there." The first half of the race on Saturday night proved to be a walk away for the Baird cars of Clay Rogers and AJ Frank. Rogers wasted little time in getting to the lead on lap four, only to give it up to his teammate AJ Frank on lap nine. Rogers got it back on lap 21 and led until the first round of pit stops. 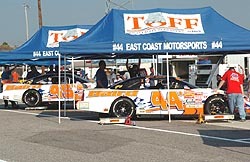 The East Coast Motorsports teams of Clay Rogers and AJ Frank ran well, then struggled at the Beach on Saturday night. That is when the bottom fell out for both the #44 and #45 rides. “We both were walking away for a bit,” said Frank, who ran second to his teammate for much of the race’s first half. “We both let each other lead some laps. Then we decide to go with the three (tires) and three (tires) pit strategy. That might have hurt us the most, because of a setup issues. just never the same though. Both cars have near identical setups and the same thing happened to the both of us. Rogers finished in 11th, the first car on lap down, while Frank finished 14th, also one lap off the pace. “Nevertheless, it was fun to run up front. It was fun for both of our cars to run up front. Myrtle Beach is just a wicked, wicked track. 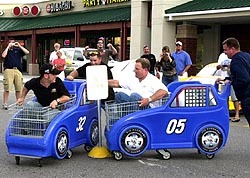 The Myrtle Beach race drew only 35 cars, marking the first race that all of those showing up for a championship event made the show. There was no one sent home. However, there were some missing name, most notably Toby Porter. Porter, who had driven the entire year with the #13 Titan Industrial team, wasn’t at the track and indications are that he and the team might have parted ways. Two drivers were off competing elsewhere. Chase Pistone was in Martinsville driving in the NASAR Craftsman Truck Series, while Steve Wallace was off in Memphis driving in the NASCAR Busch Series for his father’s team. 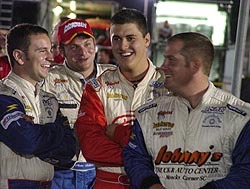 Shelby Howard, driving for Tony Stewart, failed to make the trek to “The Beach,” as did Randy Humphery and Billy Bigley. Saturday night’s Myrtle Beach race was just plain bad for series superstar Mark McFarland. Just when McFarland needed a solid finish to jump back into a contending spot for the championship, bad luck bit him once again. It wasn’t enough that he’d had issues while being one of the fastest cars in the first two Championship Series races, now, he’s fighting even more mechanical problems. Faulty front shocks relegated McFarland to a 24th place finish, dropping him to 15th in the championship points. He is 40 points out of tenth place and 165 points behind leader Benny Gordon. “This was a really, really frustrating night,” said McFarland. “That was a long race. To have the luck we’ve had lately is gut-wrenching. None of us ever saw this coming. A post-race check of the car found the culprit. Both front shocks had compressed and never rebounded. “A night like tonight can take the wind out of your sails if you let it, but we are going to finish strong,” added McFarland. The Pro Cup Series event at Myrtle Beach pretty much followed the script of Andrew Rogers' 2005 season The young driver had a good car, looked impressive by using a combination of patience and speed to run well and was hoping for a good finish. But instead of that, he got struck down by another case of bad luck. Rogers pulled out a great qualifying run, starting third. But he didn’t have a great finish, coming home 33rd. “It was just one of those deals. We had a good day going. We were fourth in practice and qualified third. That’s the best that we qualified all year, so we were happy with that. Andrew Rogers (center) was all laughts before the race, but he wasn't as happy afterwards. "The car was free at the beginning of the race and we fell to fourth. Then I got around Shane Wallace and got back to third. From there, we were basically just riding. If someone came up to us, I’d let them go and save our stuff. After the accident, Rogers drove around the track and ran into Bobby’s car before coming into the pits and fixing the damage. That earned him a penalty from Pro Cup officials. Rogers limped around for a few more laps, but retired from the event on lap 142. Jody Lavender knows his way around Myrtle Beach Speedway. He’s been around it in Late Model Stock Cars and NASCAR All Pro (now Southeast Series) cars. But things are always a little bit different when you come back in different cars, especially when those car are big and heavy. It has taken a while for Lavender to get used to running the Pro Cup car at Myrtle Beach, but he’s getting better and better. “We were terrible on that long green flag run. We were close to getting lapped. You normally don’t see that here at Myrtle Beach. We had two real long ones tonight. We did the best we could. Tim Bainey’s post season hasn’t gone quite like he’s hoped for, and things didn’t change on Saturday night, as the youngster finshed 23rd at Myrtle Beach. "We just didn’t get the car right," said Bainey. "This track is so different from anywhere that we run in the way your car loses grip, we worked all through practice and got the car to be decent. But in the race, I don’t know it just wasn’t very good." Bainey is 25th in the championship point standings, only 27 points out of the top-20. "We are a little disappointed with where we are at in the standings at this point," said Bainey. "I thought we would be a little higher, but we’ve had three bad races in a row and, well, that will knock you down in the points. But we know what we are capable of, and if we can get solid runs in the last 2 events we can still get back up inside the top 20 of the points. 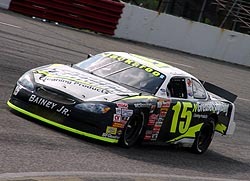 "We had a really good car at Jennerstown and Mansfield, but things didn’t work out for us. I’m sure we will have the car ready for Radford."